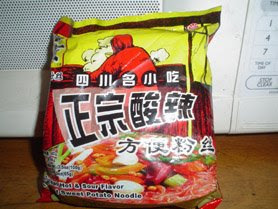 Anyone see this SzeChuan instant noodle sell in Malaysia? Or any other instant Sze Chuan foods that can get easily in Malaysia, especially Sarawak? I try to reinstall the taste as my imagination when I browse through my tabulas blog. I forgot how long I did not taste such delicious instant noodles since last time when I had it at States. I remember I bought this from oriental market from Los Angeles and brought it all over to the place where my university located. I love Sze Chuan foods very much under influenced by my few SzeChuan China friends. They can cook very well though and I had tasted few famous dishes from SzeChuan and it taste awesome! When everybody was busy to get gather for the foods, I will just cook this SzeChuan Sour and Spicy instant noodle to satisfy my tummy and I was happy enough with that. 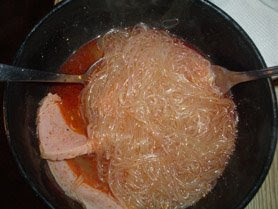 I always cook it with just add in two slices of luncheon meat from Wal-Mart, because the taste itself is good enough to put in mouth. Sometimes might add in egg into it to make it more presentable. Oh...I miss this! Really really miss my SzeChuan Sour & Spicy Instant Glass Noodle (Tan hoon).